Tuition: $2,800 USD or contact Design Engine at 312.226.8339 for an onsite estimate. This cost includes 3 months access to the Design-Engine Training Delivery System and a lifetime access to the Design-Engine tutorials used in class. $2,300 with out the TDS. Overview: Creo Training Course – Level 1 This training course is an introduction to constraint based modeling, assembly, and detailing utilizing the latest release of Creo engineering design software. This Creo training course was developed for new users who want to become proficient in Creo in just one week. This course focus is on core-modeling skills in a comprehensive manner, which includes topics such as sketching, part modeling, assemblies, drawings, and basic model management techniques. We also cover alternate workflow ideals that set users up for other modules. 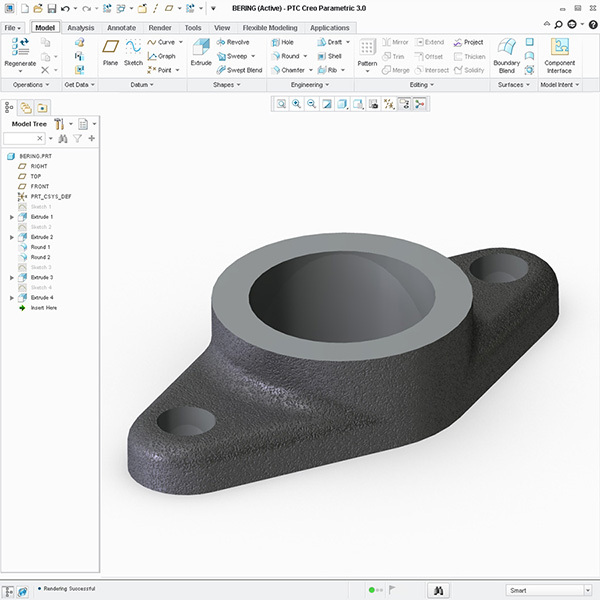 The basic Creo Modeling techniques taught in our Level One coure are often not even utilized by the more seasoned and advanced users in your office, especially if they have not previously participated in a Design Engine class in the past. This course includes over 50 comprehensive design tutorials or small projects that enable one to practice these new design workflow and skills by creating parts, assemblies, and drawings and making many changes. The exercises in this course are designed to give users the utmost confidence and experience using Creo all within one week. On-site Training: This and all Design-Engine courses are offered on-site at your facility also. Call to speak to an account manager to arrange a class 312.226.8339 today. 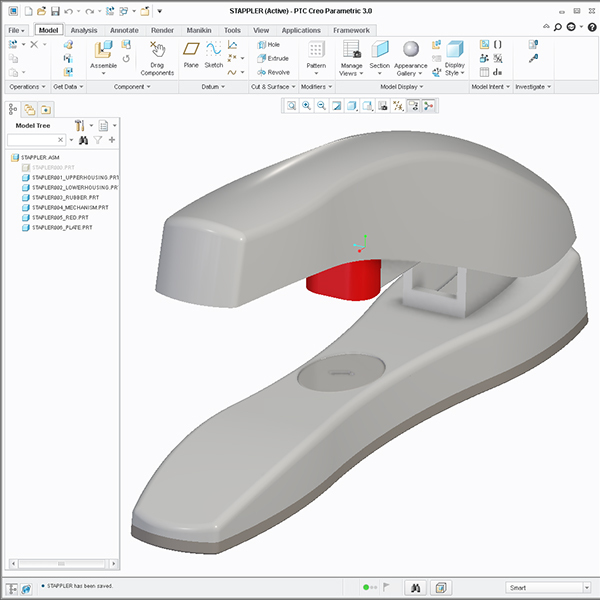 Similar Course: Industrial designers may want to look at the Learning Creo for Industrial Designers & Creo Update Training course offerings from Design Engine. Next Course: Gain deeper understanding of Creo with this Creo Detail Drawings & Creo Advanced Assembly: Level 2: or consider learning Creo Surfacing with this Learn Creo Surfacing WEEK Long Intensive or Learn Advanced Assembly Extension AAX. Prerequisite: None! A mechanical aptitude is helpful. 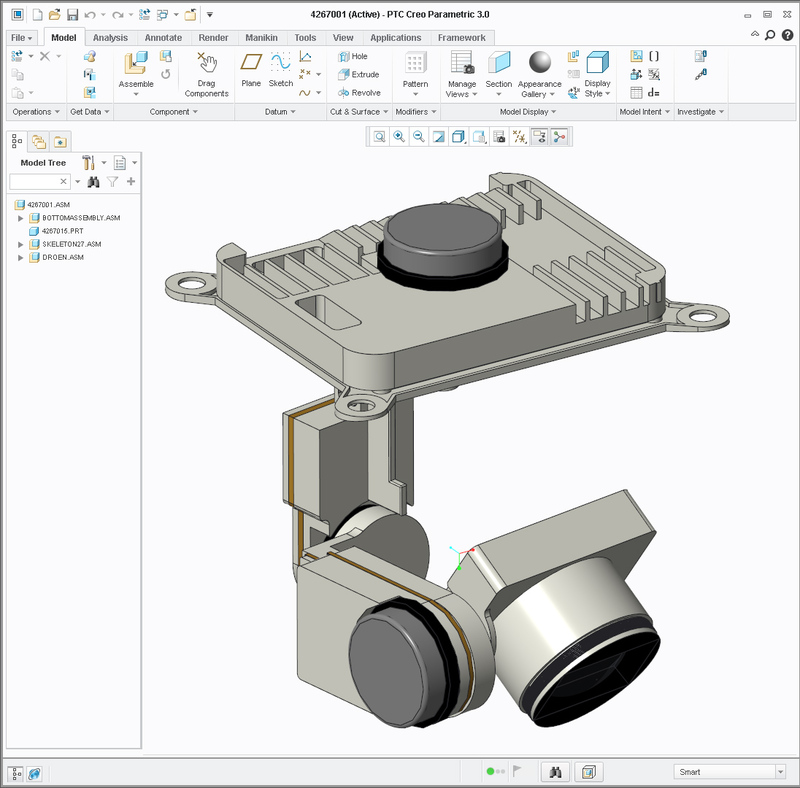 Overview of the Creo 3.0 or if you prefer, an older version of Creo or Wildfire user interface creating and assembling parts. Customizing ribbon user interface, environment, and creating map keys for a more effective user experience. Creo training exercise in the design engine level 1 class: creating blocks. Using Modify, Edit Definition, and Relations to manage features and to maintain a more precise control over geometry. Obtaining experience in modifying the Ribbon user interface and make other customization necessary to optimize the user experience with and without Windchill applications. Participants gain specific workflow for making changes to models quickly and effectively. Learning how cross sections can assist design engineers in determining the precise clearance or interference, so to make the appropriate changes with confidence. Introducing top down design, and from this obtaining a brief understanding of surfaces and many of the basics that are associated. 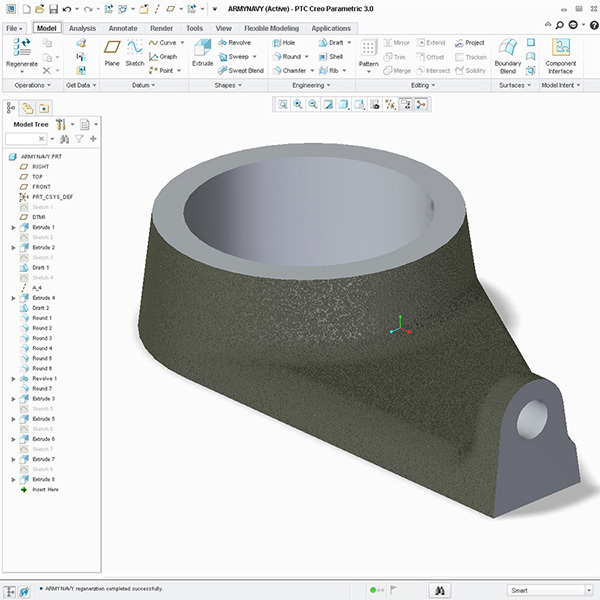 Utilizing Edit Definition (learn to redefine Creo parts that others have modeled and do that often and with confidence). Discuss piece-part modeling as opposed to the “top down” approach, complete with examples. Discuss that it is better to make twenty changes quickly to a model as opposed to simply modeling quickly. Discuss the multiple uses of drawings (to document models and their use as design tools for controlling snap fit, accuracy and locating interference). 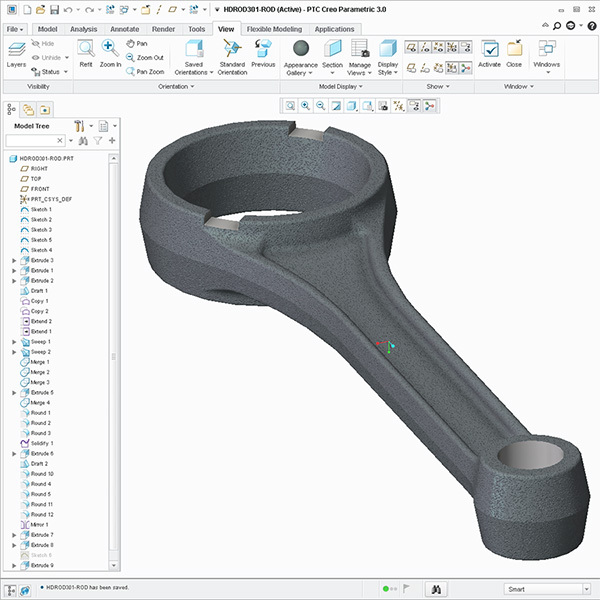 Learn how to take advantage of the parametric and associative nature of Creo tools. Discuss basic rendering using the new mental ray tools available inside Creo 3.0 ie. render, lights, materials. Also discuss how to use materials to specify machining operations or gasket locations. 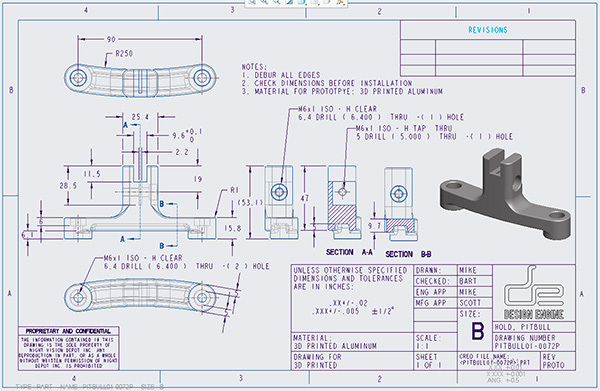 Creo Training project from the design engine training material. Building assemblies. Model and detail a series of simple blocks shapes from images on student login pages (see top image on this page). Create detailed drawings of several block models. Model and detail five fully dimensionless slightly more complicated parts from dimension drawings. Create an assembly of a pre-existing toy dump truck. 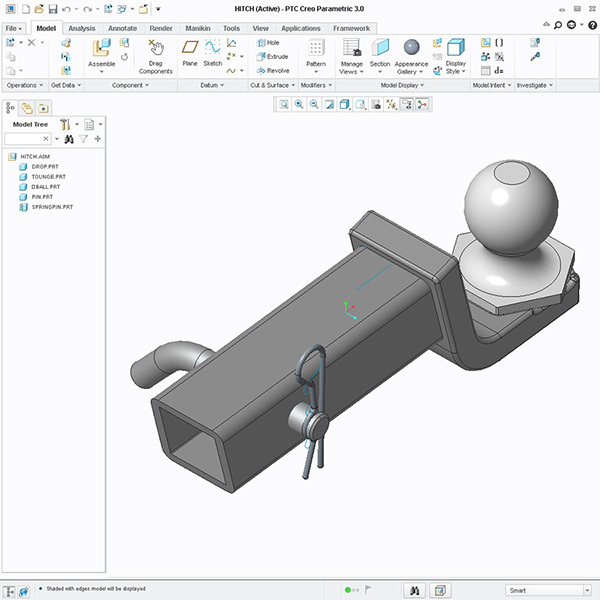 Create vise parts you modeled to create vise assembly. Learn to use view manager to create and display Exploded views. Discover flexible components and learn how to use more flexible parts to show in specific conditions within an assembly (ie. the spring can be in various conditions A) Store-bought or un-sprung B) Sprung in the assembly). Learn to use simplified reps in parts and assemblies instead of hiding parts. Modify an existing assembly of parts with interference issues of parts and assemblies that others have created. Work with examples various Rounds available. Learn to manage making interference changes on other persons parts with confidence in a child’s bath toy. Manage explode states in assembly drawings with the vise exercise. Introduction to constraint based modeling, assembly, detailing & making changes utilizing the latest release of Pro/ENGINEER. This Creo training course is developed for new users who want to become proficient learning Creo in just one week. We help you learn Creo, not read to you from an exercise book. In this course, we help design engineers learn how to make changes quickly to set them up for becoming expert. As with all Design-Engine classes, participants keep the training material login and password for life.